Happy 100th Birthday, National Parks! Join the centennial celebration by reading all about these greatest of American treasures -- from Acadia to Zion -- in preparation for a parks visit sometime soon. Filled with color photos, information on animals, fascinating lists, fun facts, maps, cool things to do, conservation tips, and much more -- think of this book as your trusted guide to these most majestic of places. 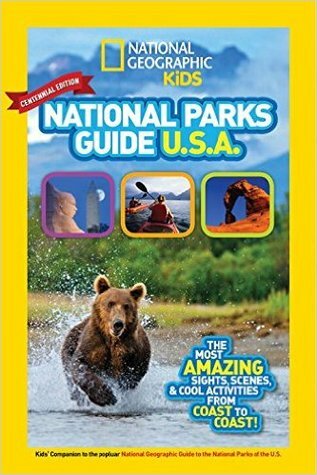 2016 celebrates 100 years of National Parks and to celebrate, National Geographic has released an updated version of this kid's guide to the national parks. The book is organized by region with several parks highlighted in each section and others briefly commented upon. Each section includes gorgeous photographs, a map, and interesting facts as well as suggested activities for each park. There are extra features for the centennial edition that look at historical sites and tips for packing, spooky sites, and endangered species. Frankly, reading this book made me immediately want to travel to all these places. ;) This is a fun book for children to enjoy and could be used to help plan trips to various parks. The book does not however tell the reader the costs to enter or use the parks or issues such as closures or traffic or parking problems. The book does include however the website information associated with each included park, which would allow the reader to get more information about the park and the various options available or in some cases to make reservations and such. A valuable resource and delightful introduction to the national parks of the U.S.A.
Andy Griffiths' Treehouse series with GIVEAWAY!